Learn how to select strategies based on the community’s readiness to take action on the issue. What is the community readiness model? Why use the community readiness model? When should you use the community readiness model? Who should be involved in using the community readiness model? How do you use the community readiness model? Often, community members are expected to respond immediately to new projects and community change without adequate time to adjust to new ideas of the knowledge to fully understand them. This section is about how to understand and measure exactly how ready a community is to address a particular issue, and how to use that knowledge to stimulate community change. Community readiness can vary across dimensions. A community may be more ready to address an issue in some ways than in others. It may know a great deal about the issue and realize it’s a problem, for instance, but be unable to conceive of implementing a particular solution. Community readiness can vary across different segments of the community. Some groups – those directly affected by the issue, for example – may be far more ready to deal with it than others. However, as we’ll see, there are some ways to help move communities toward higher levels of readiness. Understanding community readiness is essential knowledge for addressing an issue. You can easily doom an effort by trying to push a community into something it’s not ready for. People will only support what they see as reasonable, logical, and doable. You may be proposing something that’s all of those, but if the community’s perception is otherwise, the effort is unlikely to be successful. An understanding of community readiness allows you to tailor an intervention or strategy to what the community is willing to accept and support. By taking small steps forward – by setting goals that necessitate a stretch for people, but not so great a stretch as to be beyond their current ability and understanding of the issue – you can make steady progress. The Tri-Ethnic Center for Prevention Research at Colorado State University has developed a model that identifies dimensions and levels of community readiness. The model also comprises an instrument for determining community readiness that can be easily used and scored by community members. We’ll include the instrument and instructions for scoring it in the “How to” part of this section. Community efforts.To what extent are there existing efforts, programs, and policies that address the issue? Community knowledge of the efforts. To what extent do community members know about existing local efforts and their effectiveness? Are the efforts accessible to all segments of the community? Leadership.To what extent are appointed leaders and influential community members supportive of the issue? Community Climate. What is the prevailing attitude of the community toward the issue? Is it one of helplessness or one of responsibility and empowerment? Community knowledge about the issue. To what extent do community members know about the causes of the problem, consequences, and how it impacts your community? Resources related to the issue. To what extent are local resources – people, time, money, space, etc. – available to support efforts? Your community’s status with respect to each of the dimensions forms the basis of the overall level of community readiness. Remember that readiness can vary – sometimes widely – across dimensions, so that, for example, levels of community efforts and resources may be very different. The levels of readiness describe just how prepared your community is to tackle the issue in question. The community’s level for the issue you’re concerned with doesn’t necessarily correspond to its level on other issues (remember that community readiness is issue-specific). No awareness. The issue is not generally recognized by the community or leaders as a problem. Denial/ resistance. At least some community members recognize that it is a concern, but there is little recognition that it might be occurring locally. Vague awareness. Most feel that there is a local concern, but there is no immediate motivation to do anything about it. Preplanning. There is clear recognition that something must be done, and there may even be a group addressing it. However, efforts are not focused or detailed. Preparation. Active leaders begin planning in earnest. The community offers modest support of their efforts. Initiation. Enough information is available to justify efforts. Activities are underway. Stabilization. Activities are supported by administrators or community decision-makers. Staff are trained and experienced. Confirmation/ expansion. Efforts are in place. Community members feel comfortable using services, and they support expansions. Local data are regularly obtained. High level of community ownership. Detailed and sophisticated knowledge exists about prevalence, causes, and consequences. Effective evaluation guides new directions. The model is applied to other issues. Once you know your community’s level of readiness, you can plan your effort to start at that level and move the community to the next, and to continue to move the community, one level at a time. It conserves valuable resources (time, money, people) by guiding the selection of strategies that are most likely to be successful. Rather than spinning your wheels trying to get the community to do something it’s not ready for, you – and the community – can get up to speed quickly by starting in the right place. It is an efficient, inexpensive, and easy-to-use tool. It doesn’t take professional expertise to administer or score, it’s free, and it works. It promotes community recognition and ownership of the issue. Because it can be used by community members, and because it recognizes the needs and assumptions of the community, the model makes it easier for community members to see the issue and understand its effects. Because of strong community ownership, it helps to assure that strategies are culturally congruent and sustainable. It encourages the use of local experts and resources instead of reliance on outside experts and resources. Those local experts may not be “experts” in the professional sense, but rather community members who understand what’s going on and know the community. The process of community change can be complex and challenging, but the model breaks down the process into a series of manageable steps. Moving from no readiness to the highest level is a long step. Moving from the lowest level to the next one up is manageable and easy to understand. It creates a community vision for healthy change. The levels of readiness mirror the levels of community competency, and describe, to some extent, how a healthy community handles issues. The nature of the model makes it useful in virtually any situation where an issue needs to be addressed, but there are some times when it can be particularly useful. In the course of an ongoing effort. If your effort is successful, the community will be moving forward, not only in dealing with the issue, but in readiness. In order to make sure that it continues to work on tasks and goals that most members can accept and accomplish – and to move forward – it’s important to monitor readiness, and adjust your strategy accordingly. Each time you tackle a new issue. Because community readiness is issue-specific, it’s important to know where the community falls on each issue you address. Successful work on one issue may leave the community better prepared and more willing to address others, or it may leave community members complacent, and feeling that there’s not much more to be done. In either case, a campaign will have to respond to where the community is currently. When several different communities, or different segments of the community, are involved. As we’ve discussed, groups within the community may be in very different places on the readiness scale. You may need a unique strategy for each in order to mount a successful effort. When you’re planning an effort that involves a participatory process. What level of participation can you expect to begin with? Where do you have to start in order to have a reasonable possibility of success? Applying the model will help to answer these and similar questions. When you’re engaged in a community or neighborhood planning effort. Many such efforts start with the assumption that everyone is at the same readiness level, but provide very little encouragement to move. A close look at where the community or neighborhood is actually starting from might both speed up the process and broaden involvement and subsequent satisfaction with the results. In any use of the model, there are really two groups of people whose involvement is crucial: those who should apply and administer the model and assessment, and those who should be surveyed when the assessment is conducted. Who should consider using the model and/or administering the assessment? Policymakers and planners. These are the folks who usually have the most power to get things done, but often fail to think about such factors as community readiness when they devise what seem like solutions to community problems. Community activists. Many activists and organizers recognize the importance of community readiness – it’s a cornerstone of the organizing philosophy of Saul Alinsky, the grandfather of community organizing in America – but without an assessment, community activists may have only intuition to determine where a community is starting from. Health and human service organizations. These organizations are often the initiators of community efforts toward change or toward addressing issues such as hunger, homelessness, AIDS, and substance abuse. Knowing where to start such efforts is essential to their success. Coalitions. Understanding community readiness in relation to their issue can help coalitions plan and organize to address it. Anyone else interested in community or social change. Simply understanding the concept may prove valuable in any community work that citizens engage in. The model relies on the Community Readiness Assessment. The instrument itself is an interview that takes 30-60 minutes. Composed of 36 questions, it is broken down into sections, each of which addresses one (or in the case of dimensions A and B, two) of the dimensions of readiness. Questions in bold are required for scoring. Others may be eliminated or revised as needed (see the box on revision below). B. Community knowledge of efforts. Who are the "leaders" specific to this issue in your community? Would the leadership support additional efforts? Please explain. Are there ever any circumstances in which members of your community might think that this issue should be tolerated? Please explain. How does the community support the efforts to address this issue? What are the primary obstacles to efforts addressing this issue in your community? Based on the answers that you have provided so far, what do you think is the overall feeling among community members regarding this issue? E. Knowledge about the issue. What type of information is available in your community regarding this issue? What local data are available on this issue in your community? How do people obtain this information in your community? To whom would an individual affected by this issue turn to first for help in your community? Why? Do efforts that address this issue have a broad base of volunteers? What is the community’s and/or local business’ attitude about supporting efforts to address this issue, with people volunteering time, making financial donations, and/or providing space? How are current efforts funded? Please explain. Are you aware of any proposals or action plans that have been submitted for funding that address this issue in your community? If yes, please explain. Are the evaluation results being used to make changes in programs, activities, or policies or to start new ones? How do you administer and score the Community Readiness Assessment? How do you use community readiness information? We’ll look at each of these questions separately. How do you administer and score the Community Readiness Assessment? Choose and train interviewers. You’ll probably do best with people who are good interviewers or who are members of the community and are trusted by those they’ll be interviewing. The ideal is to find interviewers who fit both criteria, if possible. These folks don’t have to be experts or professionals, but they should be comfortable with others, be able to think on their feet, and have a good understanding of how to put people at ease and get information from them. In addition, even if they’re trained in interviewing skills, interviewers should be familiar with the community readiness model, so they understand the kinds of answers to probe for. Revise the assessment tool, if necessary, to reflect the issue you’re concerned with. You may need to alter or eliminate some questions in order to get important information about your specific issue. However, if a question is clearly irrelevant to your issue, you may need to drop the question unless it is in bold print. Those questions in bold print are essential for scoring. You may also want to add other questions that are more specific to your issue. If you want to add questions, add them to the end to avoid confusion when scoring. Have two people apply the questions to your topic independently and then meet to arrive at consensus on the revision. You will note that Dimensions A & B are combined. This is to improve the “flow” of the questions. We have also found the information to score these Dimensions seems to be related and it is beneficial to read items from both Dimensions A & B to get a comprehensive score for each Dimension.If translating questions from English into another language, ask a person who is very familiar with the language and culture to translate. Then, have the translated version “back-translated” into English by another person to ensure that the original content of the questions was captured. Pilot test your revised questions to make sure they are easy to understand and that they elicit the necessary information for scoring each dimension. Select four to ten people to interview. They should be people who know the community well, and they should be chosen to reflect the perceptions of a number of segments of the community, particularly of those directly or indirectly affected by the issue. Contact the people you have identified and see if they would be willing to discuss the issue. Each interview should take 30-60 minutes. Conduct your interviews. Avoid discussion with interviewees, but ask for clarification when needed and use prompts as designated. Record or write responses as they are given. Try not to add your own interpretation or to second guess what the interviewee meant. Score the interviews. Determine dimension and overall readiness scores. Scoring is an easy step-by-step process that gives you the readiness stages for each of the six dimensions. The following provides the process for scoring. Working independently, both scorers should read through each interview in its entirety before scoring any of the dimensions in order to get a general feeling and impression from the interview. Although questions are arranged in the interview to pertain to specific dimensions, other interview sections may have some responses that will help provide richer information and insights that may be helpful in scoring other dimensions. Again, working independently, the scorers should read the anchored rating scale for the dimension being scored. Always start with the first anchored rating statement. Go through each dimension separately and highlight or underline statements that refer to the anchored rating statements. If the community exceeds the first statement, proceed to the next statement. In order to receive a score at a certain stage, all previous levels must have been met up to and including the statement which the scorer believes best reflects what isstated in the interview. In other words, a community cannot be at stage 7 and not have achieved what is reflected in the statements for stages 1 through 6. On the scoring sheet, each scorer puts his or her independent scores in the table labeled INDIVIDUAL SCORES using the scores for each dimension of each of the interviews. The table provides spaces for up to six key respondent interviews. When the independent scoring is complete, the two scorers then meet to discuss the scores. The goal is to reach consensus on the scores by discussing items or statements that might have been missed by one scorer and which may affect the combined or final score assigned. Remember: Different people can have slightly different impressions, and it is important to seek explanation for the decisions made. Once consensus is reached, fill in the table labeled COMBINED SCORES on one of the scoring sheets. Add across each row to yield a total for each dimension. Repeat for all dimensions, and then total the scores. The result will be the overall stage of readiness of the community. The scores correspond with the numbered stages and are “rounded down” rather than up, so a score between a 1.0 and a 1.99 would be the first stage, a score of 2.0 to 2.99 would be the second and so forth. In the above example, the average 4.41 represents the fourth stage or Preplanning. Finally, under comments, write down any impressions about the community, any unique outcomes, and any qualifying statements that may relate to the score of your community. How do you use community readiness information? With the information you’ve gained about dimensions and overall readiness, you’re now ready to develop strategies that will be appropriate for your community.The ideal here is to do this through a participatory planning process, perhaps involving some or all of the people you interviewed, as well as others representing various sectors of the community or various groups affected by the issue. The first thing to do is look at the distribution of scores across the dimensions. Are they all about the same? Are some lower than others? To move ahead, readiness on all dimensions must be at about the same level. If you have one or more dimensions with lower scores than the others, focus your efforts on strategies that will increase the community’s readiness on that dimension or those dimensions first. Make certain the intensity level of the intervention or strategy is consistent with, or lower than, the stage score for that dimension. To be successful, any effort toward making change within a community must begin with strategies appropriate to that community’s stage of readiness. No Awareness. Here, your goal is to raise awareness that the issue exists. Make one-on-one contacts with community leaders/members. Visit existing and established small groups to inform them of the issue. Make one-on-one phone calls to friends and potential supporters. Place items in the media that explain or call attention to the issue. Denial / Resistance. To address this level, you have to raise awareness that the problem or issue exists in this community. Continue one-on-one visits and encourage those you’ve talked with to assist. Discuss descriptive local incidents related to the issue. Approach and engage local educational/health outreach programs to assist in the effort with flyers, posters, or brochures. Begin to point out media articles that describe local critical incidents. Place your own items in the media about the issue’s local effects. Prepare and submit articles for church bulletins, local newsletters, club newsletters, etc. Present information to local related community groups. Vague Awareness. Now that people recognize the problem, they have to be aware that the community can do something about it. Get on the agendas and present information at local community events and to unrelated community groups. Begin to initiate your own events (potlucks, etc.) and use those opportunities to present information on the issue. Conduct informal local surveys and interviews with community people by phone or door-to-door. Publish newspaper editorials and articles with general information and local implications. Preplanning. At this level, people are ready to start thinking about how to address the issue. Introduce information about the issue through presentations and media. Visit and invest community leaders in the cause. Review existing efforts in the community (curriculum, programs, activities, etc.) to determine who the target populations are and consider the degree of success of the efforts. Increase media exposure through radio and television public service announcements. Preparation. Here, the goal is information-gathering to lay the groundwork for planning community strategies to deal with the issue. Conduct school drug and alcohol surveys. 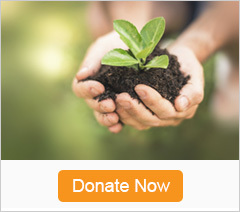 Sponsor a community picnic to kick off the effort. Conduct public forums to develop strategies from the grassroots level. Utilize key leaders and influential people to speak to groups and participate in local radio and television shows. Plan how to evaluate the success of your efforts. Initiation. As a more serious community effort gets under way, you’ll need to provide community-specific information to support existing programs and initiatives. Conduct in-service training on community readiness for professionals and paraprofessionals. Plan publicity efforts associated with start-up of activity or efforts. Attend meetings to provide updates on progress of the effort. Conduct consumer interviews to identify service gaps, improve existing services and identify key places to post information. Begin searches for additional resources and potential funding. Begin some basic evaluation efforts. Stabilization. Now that efforts and programs are in place, it’s necessary to stabilize them so as to maintain the overall community effort. Conduct training for community professionals. Conduct training for community members.Introduce your program evaluation through training and newspaper articles. Conduct quarterly meetings to review progress, modify strategies. Hold recognition events for local supporters or volunteers. Prepare and submit newspaper articles detailing progress and future plans. Begin networking among service providers and community systems. Confirmation / Expansion. Once services are stabilized, the task is to expand and enhance them. Formalize the networking with qualified service agreements. Prepare a community risk assessment profile. Publish a localized program services directory. Maintain a comprehensive database available to the public. Develop a local speaker’s bureau.Initiate policy change through support of local city officials. Conduct media outreach on specific data trends related to the issue. Utilize evaluation data to modify efforts. High Level of Community Ownership. Once the community reaches the highest level, the trick is to maintain the momentum and continue growth. You’re not done – the effort has to be sustained. At this level, community members have ownership of the efforts and will invest themselves in maintaining the efforts. Maintain local business community support and solicit financial support from them. Continue more advanced training of professionals and paraprofessionals. Continue re-assessment of issue and progress made. 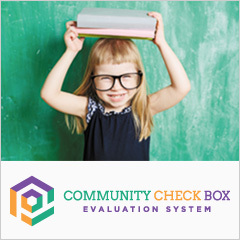 Utilize external evaluation and use feedback for program modification. Track outcome data for use with future grant requests. Continue progress reports for benefit of community leaders and local sponsorship. Understanding community readiness – how ready a community is to address a particular issue – is an important tool for anyone concerned with health and community development. A community can’t be convinced to approach an issue until it realizes that the issue exists, and furthermore, that it affects the community. A community can’t be forced into action it is not ready for, or that goes against what most of its members believe. The Tri-Ethnic Center’s community readiness model analyzes community readiness in a way that makes it possible to pinpoint a community’s level of readiness. 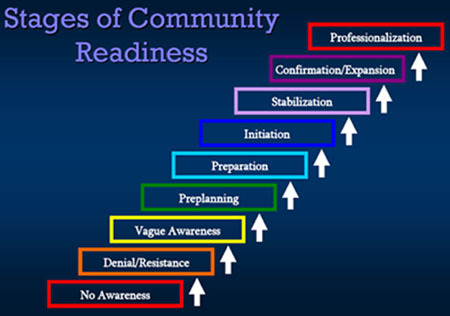 Community builders can then use that readiness information to devise strategies for addressing the issue at hand that the community will support, and that will at the same time help the community reach the next level of readiness. The community readiness model provides an accessible and relatively fast way of assessing a community’s level of readiness on a given issue. Its assessment tool can be used and scored by community members with a minimum of training, allowing the community both to save the funds often spent on outside experts and to take responsibility for solving its own problems, using its own expertise and assets. With that responsibility comes a sense of ownership and pride that, along with steady progress up the readiness ladder, is likely to make community efforts successful. 1. No Awareness. The issue is not generally recognized by the community or leaders as a problem (or it may truly not be an issue). 3. Vague Awareness. Most feel that there is a local concern, but there is no immediate motivation to do anything about it. 5. Preparation. Active leaders begin planning in earnest. The community offers modest support of their efforts. 6. Initiation. Enough information is available to justify efforts. Activities are underway. 7. Stabilization. Activities are supported by administrators or community decision-makers. Staff are trained and experienced. 8. Confirmation/Expansion. Efforts are in place. Community members feel comfortable using services, and they support expansions. Local data are regularly obtained. Detailed and sophisticated knowledge exists about prevalence, causes, and consequences. Effective evaluation guides new directions. The model is applied to other issues.